Enrol for 10 hours and Get 50% Discount in the succeeding 10 hours. CEBUANO TEACHER is celebrating its anniversary in August 2. In line with this, Cebuano Teacher is offering special prices to regular enrolees and new enrolees. 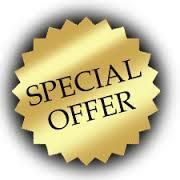 Enrol for 10 hours in the month of July and get 50% discount in all succeding 10 hours. Offer is good until July 31. 2015. Cebuano Teacher: Enrol for 10 hours and Get 50% Discount in the succeeding 10 hours.